Elkins Tri-Steel is also a wholesale distributor of rebar. We service the entire state of Texas and beyond. 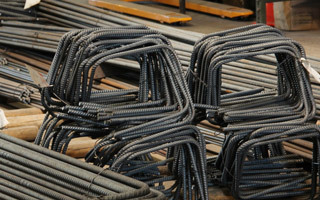 We supply deformed rebar with ranging sizes. Epoxy coated, galvanized, weldable rebar and plain round or smooth bar are also available. Not all rebar fabricators are the same. Take the large fabrication shops for example, they typically have their own employees installing their fabricated rebar. Their favorite customer is usually themselves. Smaller rebar fabrication shops often don't have the fabrication capabilities and transportation know how to get your orders turned around when you need them. At Elkins Tri-Steel, whether you're a one man operation or a large contractor you get the highest level of service in the industry because we know our success can only happen if you are successful first. Custom rebar fabrication is our specialty. We have the ability to receive and transmit your engineering specifications electronically to minimize turnaround time and expense. We utilize a system for our estimating, and state of the art technology in the preparation of shop drawings. This is to ensure the accuracy and quality of our fabrication and ensuring you, our customer, an on time delivery.